Setcreasea Pallida (also called Purple Heart or Purple Queen) is a tender perennial used as a houseplant or an annual in landscape applications. It makes an interesting piece for a combination planter as it grows upright to a height of 12-18 inches tall. As the plant gets bigger, the stems will cascade under their own weight. Although it produces small pink flowers in the spring, its large purple leaves and stems set it apart from other plants in the houseplant category. In zones 9 and warmer, the frost will kill back the top foliage, but the plants recover quickly in the warmer weather of spring. For best results with Setcreasea Purple Heart , we recommend using a constant feed program of 200 ppm N. Maintain a pH between 5.0 - 6.0. 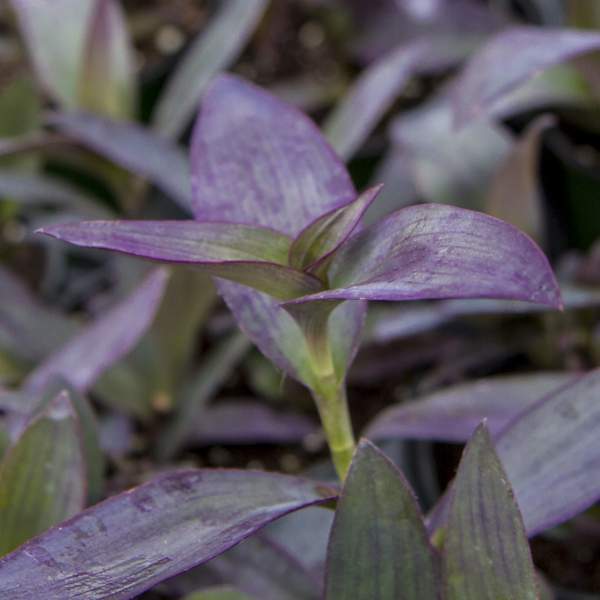 We recommend that you pinch Purple Heart 5-10 days after transplanting to your final container. They may require a second pinch to shape the plant for your final needs. Plant growth regulators are not recommended for Setcreasea Purple Heart . Setcreasea aren't prone to many pests, but watch for an occasional Spider Mite. Setcreasea Purple Heart is not prone to many diseases, but don't oversaturate the soil. If the plant sits in moist soil for an extended amount of time, you could end up with root rot or botrytis. Botrytis grey rot is usually associated with wet or humid conditions. You can prevent botrytis by allowing the plant to dry out between waterings, allowing for good airflow in your greenhouse, and spacing to allow the sun to penetrate to the soil level. The most common chemicals used to treat botrytis and root rot are Medallion and Banrot. Use them as a drench according to each label's instructions.